We had the most wonderful of problems last week as we prepared for our monthly Hidden Garden Steps project onsite clean-up: the possibility of having more volunteers than could be effectively put to work for the two-hour Saturday afternoon event. And we quickly found a winning solution for everyone by invoking one of our main vision statements for the project: collaborating with as many partners as possible to complete a $300,000 volunteer-driven community art and garden project. Our monthly efforts to remove graffiti, sweep the 148 steps on 16th Avenue between Kirkham and Lawton streets, develop gardens with donated plants (please see our online wish list for more information about specific donations needed for those gardens), clean clogged gutters and drains, and prepare the site for installation of a ceramic-tiled mosaic similar to what exists on the Moraga Steps here in San Francisco’s Inner Sunset District has steadily gained attention, support, and recognition since our first clean-up event was held less than a year ago and trees were trimmed free of charge by a generous donation of time and services from Tree Shapers, LLC. Promotions through our San Francisco DPW Street Parks Program and San Francisco Parks Alliance partners (particularly Nancy Wong from DPW, who routinely delivers the gloves, tools, and other supplies needed, and Maria D’Angelico and Julia Brashares at the Alliance) help draw new volunteers to us each month. 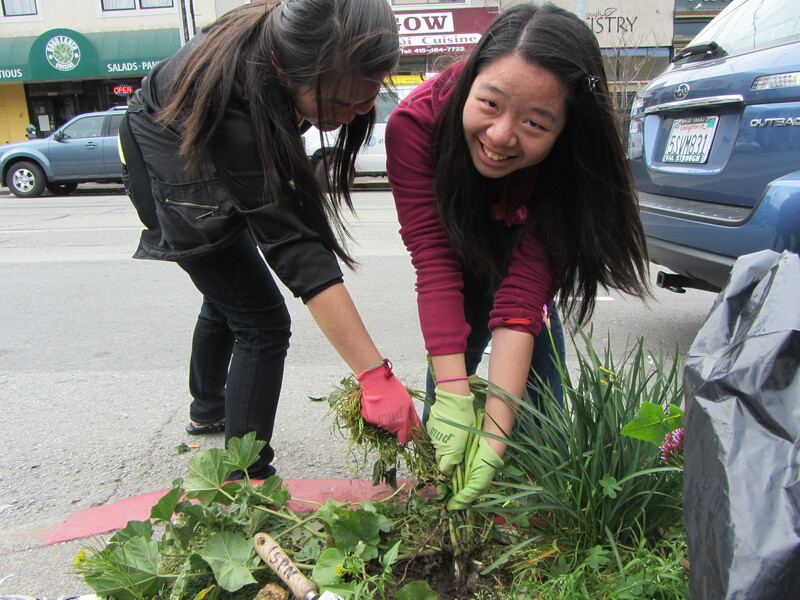 And a photo and blurb in San Francisco City/County Supervisor Carmen Chu’s latest newsletter inspired Elvina Fan (pictured here) and her fellow Lincoln High School Change SF members to contact us less than two days before the March clean-up to see how they could help. This created a bit of a dilemma since nearly 10 members of Better Homes & Gardens Mason-McDuffie Realty here in San Francisco (pictured above, left) had already promised to join us for work that required no more than 15 people. But it was a dilemma quickly resolved through early-morning email exchanges with Andrea Jadwin, co-president of the Inner Sunset Park Neighbors board. 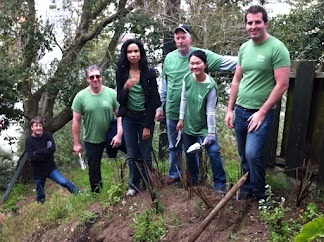 She had a perfect project in place—and was willing to make arrangements with the Change SF volunteers on short notice. “ISPN won a Community Challenge Grant in 2010 to make improvements to the parking lot in the heart of the Inner Sunset commercial district,” Jadwin recalled during a recent exchange. “The parking lot is home every Sunday to the Inner Sunset Farmers’ Market and other community events throughout the year. Volunteers planted native and climate-adapted plants and painted the surrounding walls with coordinating colors and a simple design. Community Challenge Grants award funding is based on volunteer hours, so we try to organize several maintenance projects throughout the year—cleaning trash, weeding, replanting, and covering graffiti”—exactly what the Change SF students were offering to do for Hidden Garden Steps. “It was great to have the students from Lincoln High’s Change SF service club come out and provide some much needed plant care and graffiti abatement. The neighbors, merchants and farmers will be so pleased with the results,” Jadwin concluded. We sometimes hear, from those who are misinformed, that people are too busy to volunteer and that organizations need to compete rather than collaborate in attracting great volunteers and other supporters. But we certainly aren’t seeing either of those issues here in San Francisco’s Inner Sunset District. Volunteers from the Hidden Garden Steps project, the Inner Sunset Park Neighbors, Nature in the City’s Green Hairstreak [Butterfly] Corridor project, and other groups are working together toward our common goal of nurturing a sense of community that makes our neighborhood a place where we all belong. And we have the volunteers and other partners to prove it. N.B. : This is the tenth in an ongoing series of articles to document the Hidden Garden Steps project in San Francisco.